The department generally graduates between 12 and 20 chemistry majors per year. Many of our recent chemistry majors have garnered special awards such as NSF and ACS graduate fellowships, Howard Hughes Medical Institute fellowships, and Beckman fellowships. Three have been selected to receive the college's most prestigious academic award, the Williamson Medal, at graduation. A student may elect to wait until the Spring semester to take CHM112, and after the successful completion of CHM112 by the student with a grade of C-minus or better, the CHM179 credit would be converted to CHM111 credit. The student would need to contact the Chair of the Chemistry Department to ask for this conversion. The Chemistry Department also recognizes the accomplishment of students who have performed well in an International Baccalaureate (IB) program or in an A-levels program. If a student’s performance in chemistry courses as part of either an IB or A-level program is sufficiently high to be awarded F&M credit, then such credit will be considered in the same manner as AP credits in chemistry; i.e., a course credit for CHM179 will be awarded with the same conditions as noted above. the course must be part of the chemistry major offered by a Chemistry Department that is approved by the American Chemical Society. the content of the course as described by lecture and laboratory syllabi must match the content of the corresponding F&M course. lecture and laboratory hours as determined by the course syllabi and the official course schedule must be a least 80% of the lecture and laboratory hours of the corresponding F&M course; e.g., general chemistry and organic chemistry courses have 52 laboratory hours, so corresponding transfer courses must have at least 42 laboratory hours. the course must have similar prerequisites as the corresponding F&M course; e.g., an organic chemistry course must have general chemistry as its prerequisite. Because courses change from time to time, the review of summer courses is done each year. Thus, courses that were approved in a previous year may not meet the criteria for approval in the current year and, conversely, courses that had not been previously approved now may meet the criteria for approval. The following documentation is required in order to determine if any summer school chemistry course meets the approval criteria for transfer to Franklin & Marshall College. Before gathering the necessary documentation for any courses at specific institutions, students should check with Professor Thomsen to determine if current year courses already have been reviewed. Name and address of the institution. If the institution has more than one campus, the information must be related to the appropriate campus. Note: Only courses offered by a chemistry department with a program approved by the American Chemical Society will be considered for possible transfer to F&M. Click here for a list of the American Chemical Society's approved programs. An official document from the institution that provides descriptions of each course and their place in the chemistry major; e.g., a course catalog. A printed copy, a copy in pdf format, or the institution’s official URL for the catalog are normally acceptable. The summer course syllabi for lectures with topics and textbook information and summer syllabi for the laboratory with lists of experiments and associated schedule. If such documents are not available for the upcoming summer sessions, then documents from the previous year’s summer session courses might be sufficient. Syllabi from the academic year are normally not acceptable. An F&M Department Approval Form for courses taken at accredited institutions other than F&M, which is available in the Registrar's Office. When a student has all of the required information, he or she should contact Professor Van Arman (Hackman Room 407, scott.vanarman@fandm.edu) to make an appointment for review of the information. Although a course review can be made any time before a summer course begins, the best circumstances are to have the course reviewed prior to the end of the spring semester. Nearly 900 ACS Student Affiliate chapters are established in two- or four-year colleges and universities. These chapters serve as leadership organizations for undergraduate chemical sciences students, providing professional experiences, graduate school information, and other career development resources. The F&M Student Affiliate Chapter typically has 25-30 chemistry students as members. These students have participated in a wide variety of activities including serving the community through an Elementary School Outreach program which treats children to demonstrations of the wonders of chemistry. The Affiliates have hosted many of our invited lecturers, and each year they donate a $50.00 savings bond award to the local Science Fair. The Chapter has fund-raisers throughout the year and sponsors an annual picnic and dinner. 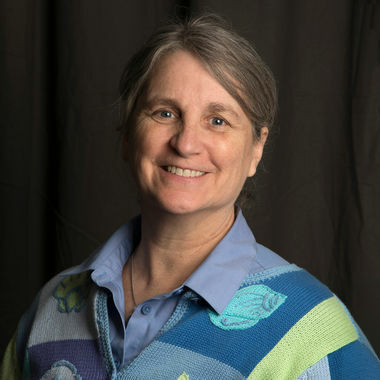 The faculty advisor to the club is Dr. Phillips-Piro of the Chemistry Department. Over the past 10 years more than 20 chemistry students have participated in one- or two-semester study abroad experiences. 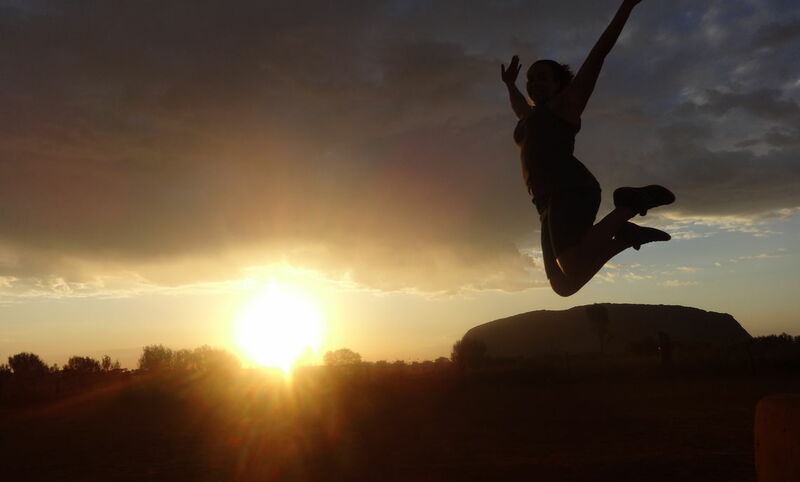 Students have studied at universities in England, Scotland, Ireland, France, Germany, Austria, and Australia, often through traditional approved study abroad programs. In addition, TASSEP (Trans Atlantic Science Student Exchange Program) offers a one- or two-semester experience for science and mathematics majors at numerous universities throughout the European Union states. Students may enroll in a range of courses, with particular emphasis on science courses. In general, students studying abroad live in the residence halls and participate fully in the life of the university. Dr. Moog of the Chemistry Department is the program advisor. Katie Egan stops for a smile in front of old Ben. "I studied at the Univ. of East Anglia in Norwich, England where I took Inorganic Chemistry to fill my major requirement. Each of those classes had about 80 students in them and the lab sessions really made me appreciate the hands-on experience we get at F&M. 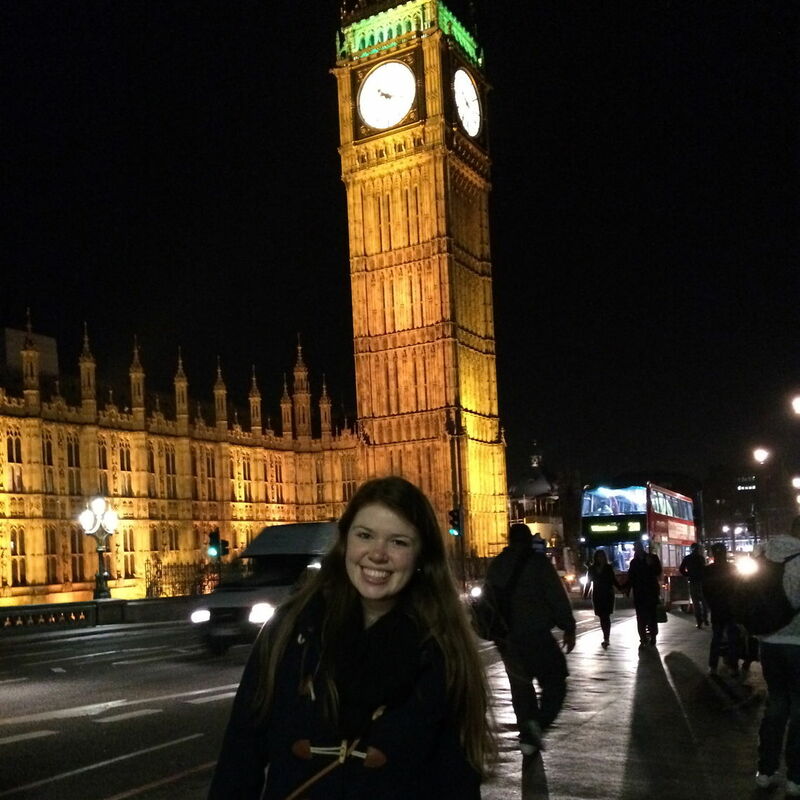 Being able to study abroad and still take chemistry was an amazing experience and if anything it made me appreciate F&M that much more." "Australia as a whole was fantastic and exciting. While in Australia, I took Analytical Chemistry. This course was surprisingly focused on forensic chemistry which I found to be fun and engaging. To anyone thinking of traveling ‘Down Under’ I highly recommend it!" 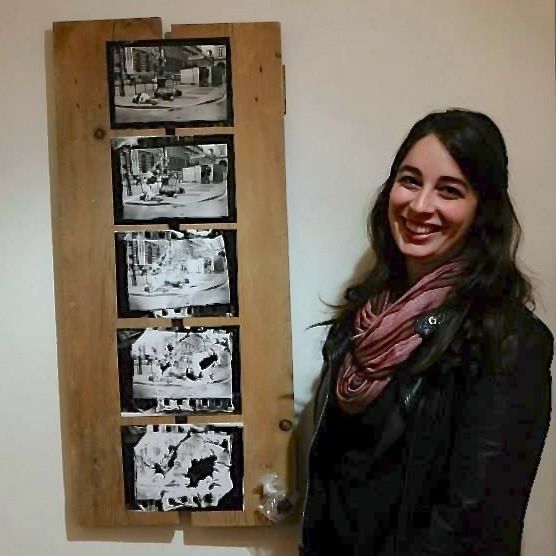 Marisa Sobel went to Florence, Italy, to study art conservation, as a possible means to combine her two majors (Chemistry and Studio Art). "I worked in a conservation lab learning how to apply current cleaning and repairing methods to hundreds of years-old paintings. I also further developed my own artistic voice in an advanced Black & White photography class, part of which I experimented with the emulsion after development. My final piece (pictured) was selected for the juried student show and includes a selection of the experimental prints. Although the conservation trade is no longer one I wish to pursue, I absolutely loved my semester immersed in the Italian lifestyle." Through the generosity of alumni and friends of the college, endowed scholarships have allowed students to broaden their college experience in a variety of ways. We are indebted to these charitable donors. These scholarships are awarded by the Financial Aid Office. A description of the scholarships, each of which is unique in its selection criterion, follows. Established in 2001 by Leah Schultz Cutler ’90, and her husband Benjamin Cutler ’91, in memory of Leah’s father, Marvin A. Schultz. Income only shall be used annually to provide financial assistance to a student majoring in Chemistry, maintaining a GPA of not less than 3.0. Preference shall be given to support the same student over consecutive years if appropriate. Established in 2006 by Dale W. Oller, M.D. '64 and Susan G. Oller in memory of Dale’s grandfather, John S. Oller, and father Captain John S. Oller, Jr. '41. Income only from this fund will be used annually to provide financial assistance for one or more students demonstrating financial need. The scholarship should be awarded to sophomores, juniors, or seniors who have maintained at least a 3.0 GPA and are majoring in Chemistry. Established in 2009 by gifts from Dr. and Mrs. Patton’s four children. Income only from this fund will be used annually to provide need-based scholarship aid for a full-time student or students at the College. Preference will be given to students who are majoring in the sciences or are part of the pre-healing arts program. The endowment will then stress “science for the benefit of humanity” and encourage students to pursue careers in biology, chemistry, geology and physics. 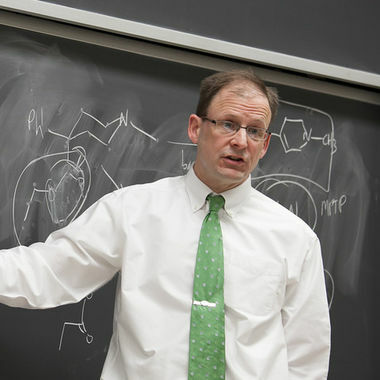 Established in 2011, the income from this scholarship fund is awarded to a rising junior or senior who has expressed to the chemistry department “interest in teaching chemistry either at the college-university or high school level, including plans to pursue a graduate degree in chemistry.” Candidates are selected based on the strongest academic achievement among those who demonstrate financial need. To provide financial assistance for one or more students demonstrating financial need with the donor’s preference to have this scholarship awarded to a chemistry major in need of financial assistance. To provide scholarship assistance for students, with preference to females majoring in chemistry, mathematics, or physics. Through the generosity of alumni and friends of the college, endowed awards, dating back to 1912, have allowed students to broaden their college experience in a variety of ways. We are indebted to these charitable donors. The recipients of these awards are chosen by the Chemistry Department. The oldest and most prestigious award in chemistry is awarded to the senior major who scores the highest on an exam covering five areas of chemistry: General, Analytical, Organic, Inorganic, and Physical. The student's name is placed on a plaque and the student receives the income from the endowment established by Herman Luther Willig. The income from the trust is paid annually to a graduate of Franklin and Marshall College who has been accepted and is enrolled in post-graduate research work in a reputable college or university pursing a definite course in biology or chemistry. Established by Mrs. Marie Saulnier and her family to memorialize their late husband and father, the award is given each year to the student majoring in Chemistry who in the opinion of the faculty of the Department of Chemistry demonstrates an especially searching mind in probing the frontiers of the unknown. Income from the fund created in honor of Professor Fred A. Snavely, '49 and Professor of Chemistry from 1952 to 1985, will be used to fund two annual student awards—the Snavely Academic Year Research Award and the Snavely Summer Research Award. The award recognizes Professor Snavely's dedication to excellence in teaching and research within the department. a written report from the most recent summer research associated with F&M must be submitted by the research director for all faculty members of the department to read. This report must include a discussion of future goals of the project that will be addressed in CHM 490. A student will be nominated for the Snavely Award by the faculty research director when the director submits the written report to the department for review at the beginning of the fall semester. To be eligible for the Snavely Award, a student must be registered for CHM 490 (CHM 390 is not acceptable.) Selection of the award recipient from the pool of nominees will be accomplished by written preferential ballot. The award is given to a rising F&M senior of high academic standing majoring in a natural science with a significant chemistry focus. This award is to be used to enhance the educational experience of students in chemistry during their undergraduate years, and, if applicable, through the summer following their senior year. Walter E. Weibrecht, Ph.D. '59 and his partner, David W. Garside, together with Ernest C. Weibrecht and his wife, Gail M. Weibrecht, have established this scholarship to honor Walter and Ernest's parents, Ernest and Annie Weibrecht. 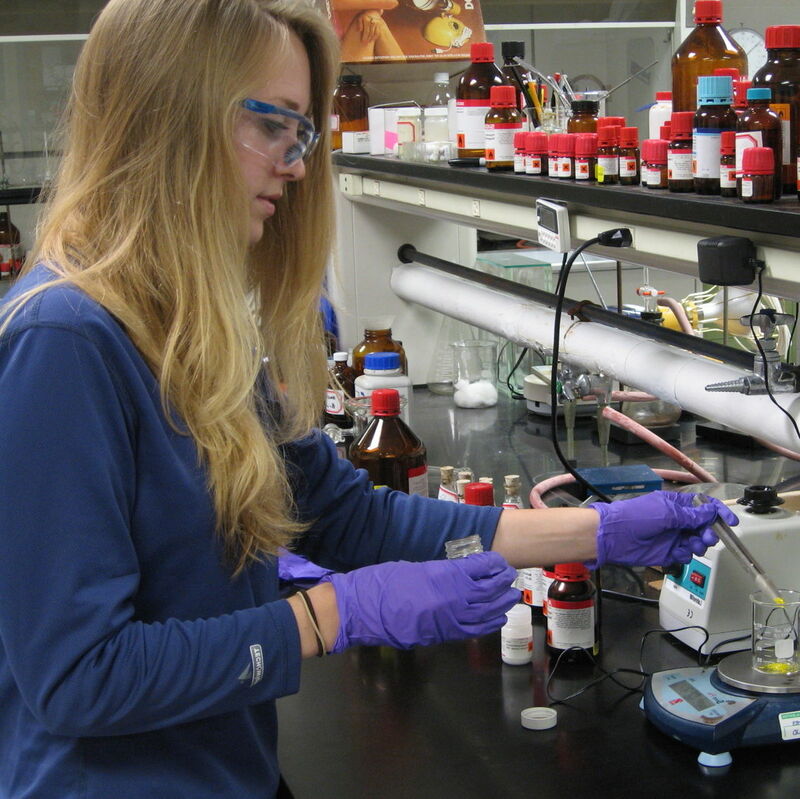 For full details on the many awards and opportunities to support student summer research, visit the Chemistry Student Summer Research Financial Support section. All students enrolled in chemistry courses or involved in independent research are required to attend a Laboratory Safety training session annually. A team of risk management specialist lead these sessions which focus on safety and education of basic governmental policies for reducing risks and handling chemicals in the laboratories. After attending Franklin & Marshall and with the recommendation of the engineering committee, and the approval of the students major department, the student transfers to one of the five affiliated engineering schools for two years of concentrated study in the chosen engineering field. After successfully completing this five or six year program, two degrees are conferred: a bachelor of arts with a major in the student's chosen field from F&M and a bachelor of science in engineering from the cooperating institution. Information about pursuing an Engineering degree along with your F&M degree, visit the Student and Post-Graduate Development Office's "Engineering at F&M" webpage. "How I Became an Engineer at Franklin & Marshall College"
I began my education at Franklin & Marshall College as a pre-med student with a strong interest in Chemistry. I spent the majority of my summers and free time in the Chemistry department doing research on the structure and substitution patterns of members of the apatite family. (Apatite is the main inorganic constituent of bones and tooth enamel). As I progressed through the pre-med track, I discovered a love for physics and decided to further pursue the discipline. What most excited me about research was the identification of a problem, or a gap in knowledge, and the development of a plan to solve it. I was drawn to physics because it provided the ability to precisely explain physical events with mathematical models. After speaking with the director of dual-degree engineering programs at F&M, I decided that the engineering track was the right choice for me. It combined my love of biological sciences with the mathematics and physics that I enjoyed. I had the option of a 3-2 or 4-2 dual bachelors degree, or a 4-2 bachelors and masters degree. The affiliate combined-degree programs were with top-tier engineering schools, such as Columbia University, Washington University in St Louis, and Case Western Reserve. As the 3-2 program required my completion of my Chemistry degree by the end of my junior year, and it was late in sophomore year at this point, an MS degree after four years of F&M was the best choice for me. For the next two years, I completed as many physics and mathematics courses as possible and applied to a few Master of Science programs in Biomedical Engineering during the winter of senior year. This December, I will graduate with an MS in Biomedical Engineering from Columbia University. My experience at Columbia not only taught me a great deal about the field of BME, but also demonstrated the caliber of the F&M education. Due to the rigor of F&M, I found myself incredibly well prepared for the coursework at Columbia. Though I am one of the few students that did not have an engineering background in my program, I have found that my different academic perspective has only enriched my education. The expectations of the F&M undergraduate curriculum taught me how to problem solve, approach and conduct laboratory research, and study at a graduate-degree level. These skills have allowed me to excel and gain the most from my education at Columbia. I was able to take my required courses while also working on a start-up company, and conducting graduate research. I am grateful to have had the opportunity to grow as a student and scholar at F&M before proceeding into graduate studies. The reference section and additional material from the General Chemistry (CHM 111/112) Laboratory Manual is available here as an interactive pdf. The Quantitative & Science Center currently has over 30 tutors who primarily help students with introductory biology, chemistry, and physics courses. At Q&SC, our tutors strive to facilitate questioning and learning techniques that will prove necessary throughout a student's time at F&M. Use the Add Content button to get started. Should I take chemistry my first semester? F&M's graduation requirements do not include a chemistry course, however, chemistry is needed for several science majors and many graduate health professions programs. The first chemistry course in the sequence, CHM111, is offered only in the fall and, due to the verticality of the subject in this course, must be taken prior to any additional chemistry courses. You are interested in pursuing a major in Biology, Chemistry, Biological Foundations of Behavior, or Biochemistry and Molecular Biology, and possibly Environmental Science. You are interested in pursuing health professions requirements and plan to complete them by the end of the junior year, or are interested in a study abroad experience either semester of your junior year. Students taking chemistry the first semester and planning to major in the sciences typically take mathematics and two additional courses. The same advice applies to most students pursuing health professions requirements. If you have an AP or IB credit in chemistry, see Chemistry's Transfer Credits section. Chris Bemis '14 received first place in the Organic Division of the Intercollegiate Student Chemists Convention at Albright College in April, 2014.